I am about to describe one of the best experiences of my life. It all started off like an ordinary day, we were going for a picnic with some friends, it was beautifully sunny and, yeah, everything seemed normal. About an hour before we were going to leave Dad told us that, yes, we were going for a picnic, but we were doing something else first. I was intrigued, as I’m sure you are now. Dad revealed, after a while, that we were going flying in a plane! Our friend built his own plane, which he flies quite regularly from an airfield near Lewes. He often flies over our house and sometimes we wave. He had offered before to take us up, but I never thought it would happen. Now it was. A strange feeling crept up inside me, I was utterly excited and a bit nervous, as I’d never been in any sort of plane or flying machine. I’m sure my stomach flipped when Dad said the words “flying in Dave’s plane”. I’d always fantasize about flying high up in an aeroplane. I’d dream about it too, but then I’d wake up because I couldn’t really picture what it would be like. The plane is called a Streak Shadow and it seats two people. It was amazing to think that Dave built it all by himself. My sister went first, then me. I clambered into the cramped cabin and sat down. I had to undergo a safety check where I was shown how to undo the seatbelt in an emergency and how to open the hatch. I had to wear headphones with a speaker to communicate during flight. Then we were ready for takeoff. Dave, the pilot, spoke into the radio to tell them that we were departing. Pilots talk in a sort of code with coordinating words and long series of numbers. I learnt that you never say the words ‘take off’ unless you are actually about to take off. You should always try to take off into the wind when in a plane. Sometimes there is what is called a crosswind, where the wind blows across, not down the runway. There was a slight one today, but we looked at the windsock and judged the best direction to go in. Soon we were racing down the runway at almost 150mph. Then we were in the air. Gradually we gained height until we were 2000ft above the earth. We slowed to about 80mph. Finally, I had the chance to get a proper look at the ground below. Immediately, I thought of my Granny’s dolls house! Everything was miniature. The sheep in the fields looked like ants and the fields themselves stretched away into the distance like a patchwork quilt with hedge stitching. Because the plane was so small and light, you felt every little, tiny movement. Every jerk and every lurch, and every gust of wind. Dave took me on a tour of the area, pointing out the sights. Then we flew over and saw the coastline. I was absolutely loving it. Then Dave asked me if I’d like to have a go at using the controls. I said, over the intercom, that I definitely would. He showed me how everything worked and I had to use the joystick, which is the steering instrument. Right is right, left is left, forward is down, backwards is up. What I didn’t realise is that only tiny jiggles are needed. I pushed forward really hard and we literally plunged downwards. That was very, very, very scary. After a while I got the hang of it. Dave put his hands on his head to prove that I really was flying the plane alone. I practised picking a point on the horizon and steering towards it, keeping it in the centre of the dashboard. The landing was a little nerve-wracking since we came in at a weird angle due to the crosswind.My whole flight in one word: exhilarating. At the end of the day, I received a Young Aviators Certificate. It was brilliant. I would like to thank Dave for giving us such an awesome experience. He was so willing to teach us and share with us, we really loved that. He also taught us a lesson in generosity. I hope that other people will be like this as we journey through life. I hope you like this short story that I wrote. I’m working on my story writing and I do believe it’s slowly improving. This story is like a fable, it has a moral, and the moral is that your parents may make you work hard and learn lots, but they’re doing it because they want to prepare you for life. And they want the best for you, because they love you. Dad and Mum talk to us about this all the time. They are always teaching us things and it’s because they care. There once was a family that lived peacefully up in the High Hills. They lived a simple life, in a simple little cottage, on a simple little farm. The children never knew anything about the outside world, but the parents did. Every evening they would sit by the crackling fire, the littlest on the Father’s knee, the other three curled up on the rug. The Father would tell stories of big cities, millions of people, great palaces, schools, brightly coloured markets, beautiful sunsets not blocked out by hills, mountains that touch the sky, majestic forests and exotic animals and oceans that stretch further than the eye can see. The children felt refreshed and inspired after their Father’s speech and they set about it once again. This time they stuck to it. They learnt more and more and they began to do things for themselves ever oftener. Their Mother watched them with tears in her eyes, but also pride and joy. Their Father just looked on, content. He rarely had to say anything nowadays. Eventually the time came when the children were ready to leave. Their parents stood on the hilltop, outside the little cottage, and watched them go. Four birds, flying free. 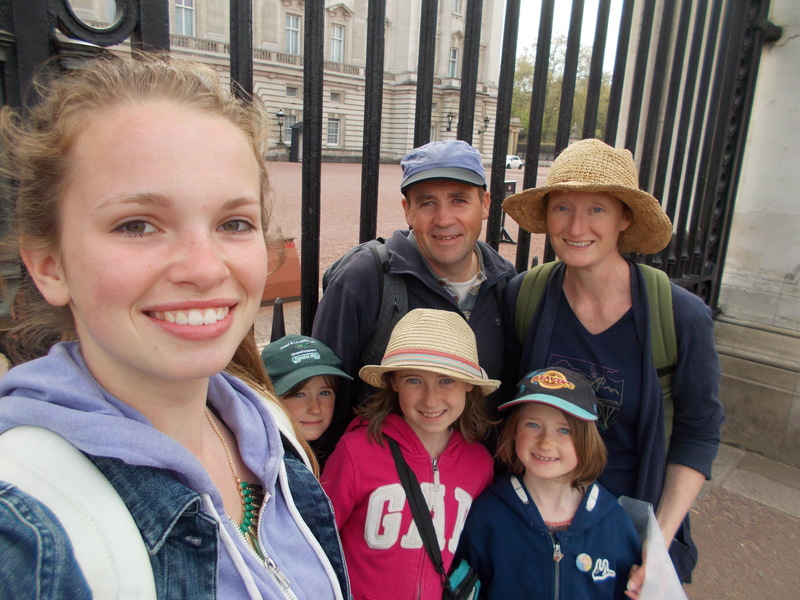 Yesterday we took Clairie, a young girl from Germany who is doing a bit of work experience at the campsite/farm where we live, into London to see all the sights. 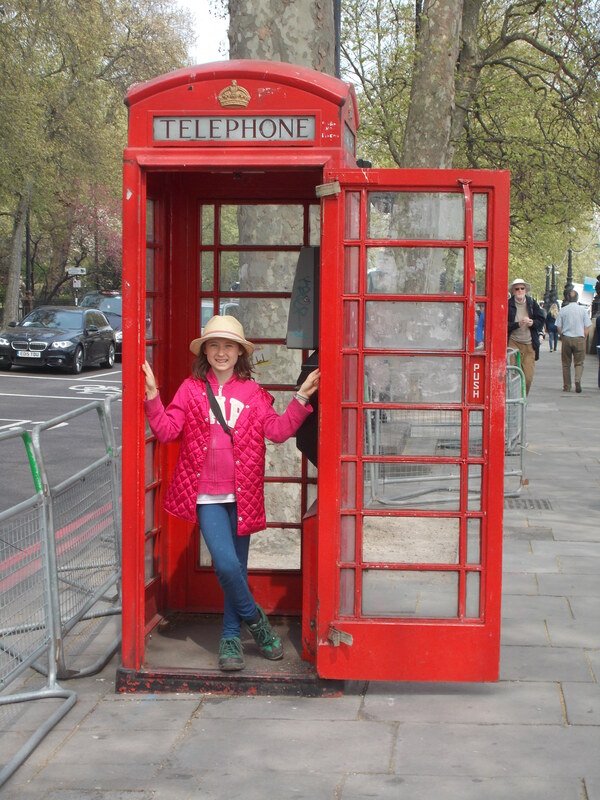 It is her first time in the UK, so we made sure that she saw all the things that are unique to our capital city. 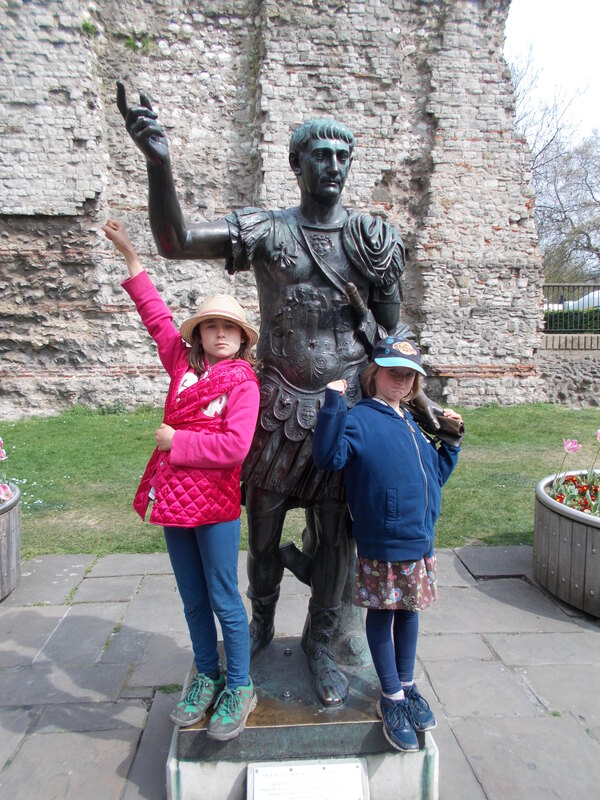 We explained to her about British history, from Queen Boadicea of the Iceni tribe to Guy Fawkes and from KIng Henry 8th’s many wives to the legend about the ravens at the Tower. 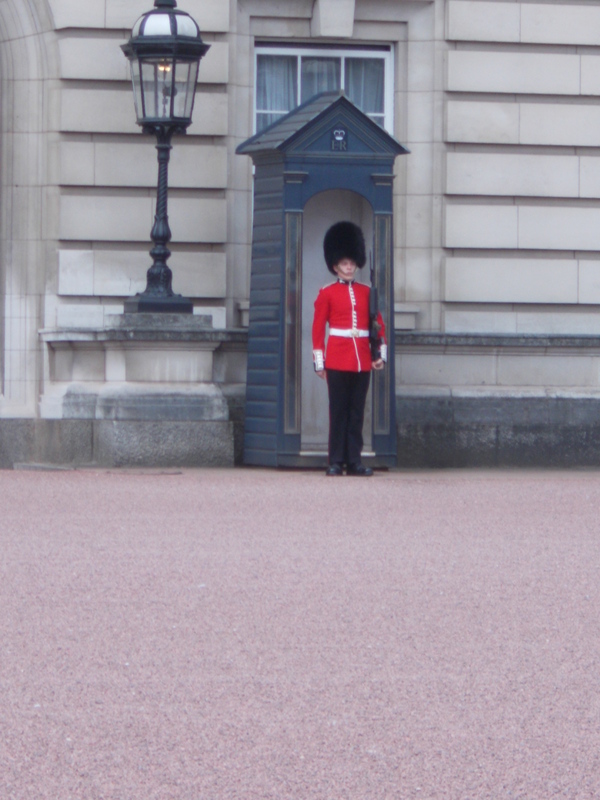 First stop was Buckingham Palace to see the Changing Of The Guard. This is a major tradition so Clairie had to see it. The Busbies looked so smart in their uniform, it must be really hard to stay still and not smile all day while people are staring at you and snapping away with their cameras. 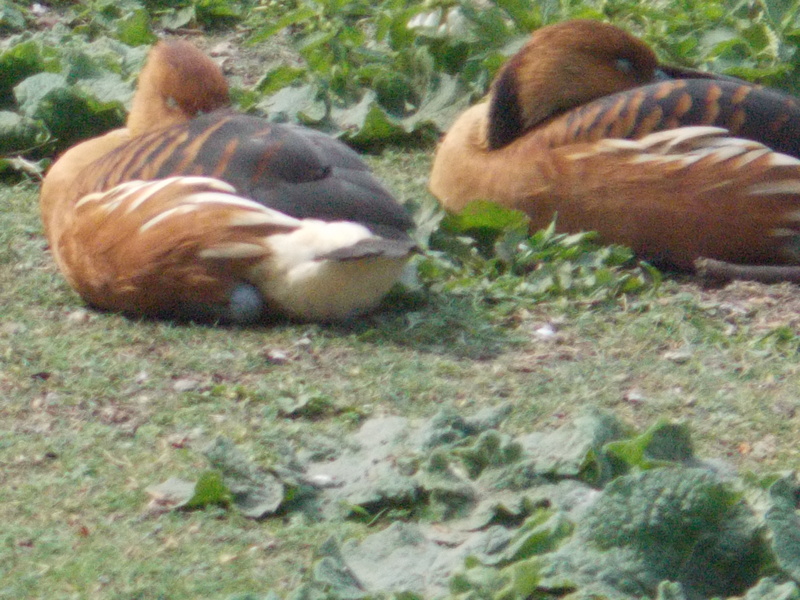 After Buckingham Palace we walked through St. James park. Clairie and I took loads of photos of all the different breeds of birds, including wigeon ducks, black swans, mallards and even white pelicans. Me, Evan and Irys with a member of the Household Cavalry. 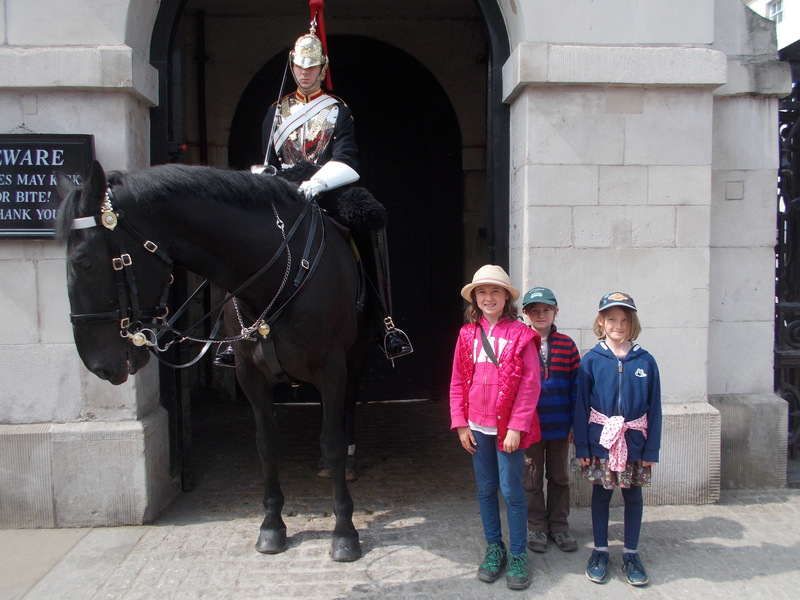 We visited the Household Cavalry and had our picture taken with one of the horsemen. Just like the Busbies, he couldn’t smile!!! 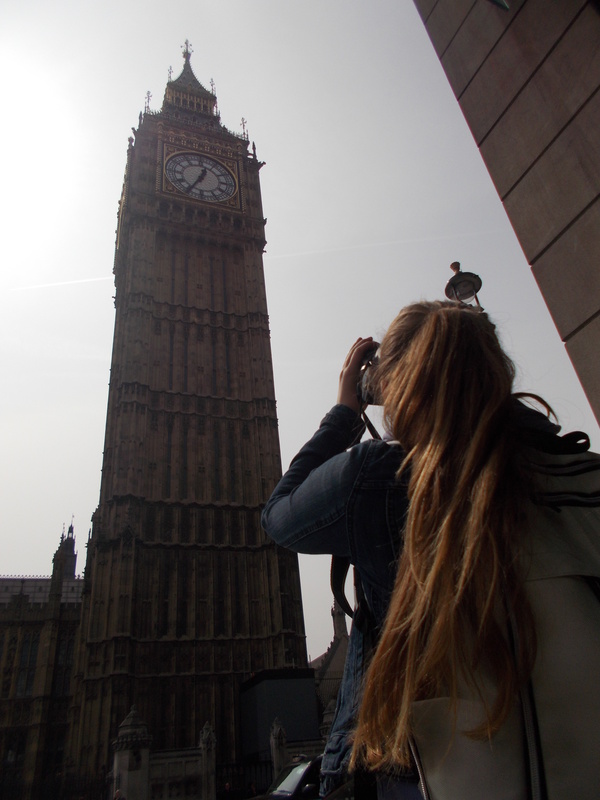 We visited Big Ben and the Houses of Parliament too. Clairie is really into photography, so she took lots of amazing shots. 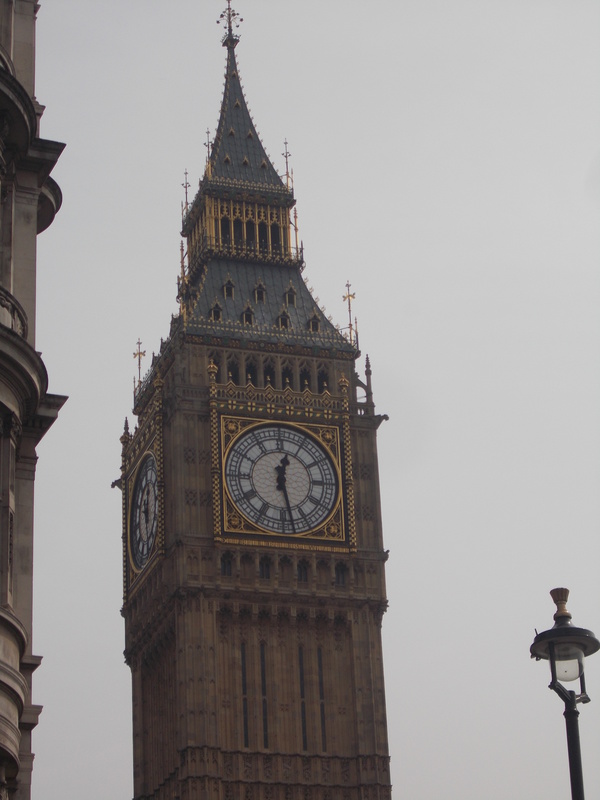 Big Ben is stunning, I love all the gold leaf and the sheer height of it is incredible. The Houses of Parliament are also lovely, they’re rather posh and very beautiful. We walked along the Embankment on river Thames. 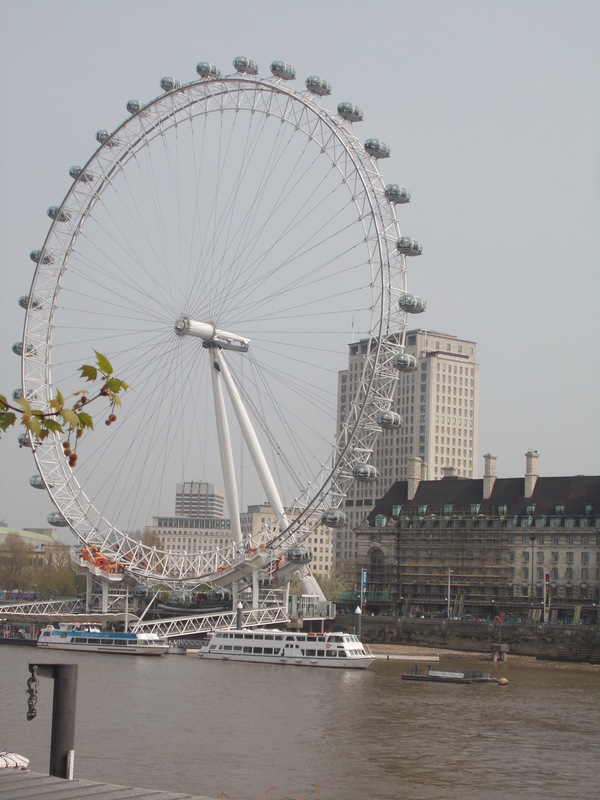 We saw the London Eye. 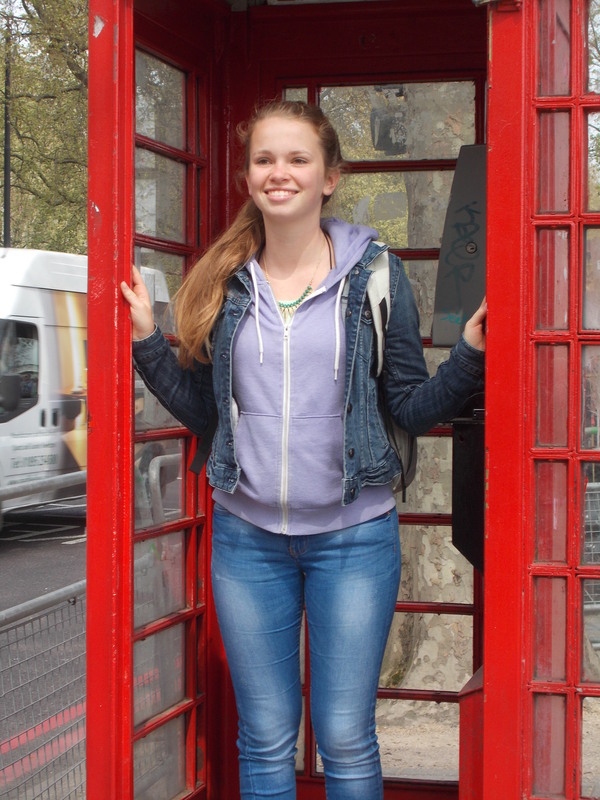 Clairie and I had our pictures taken in one of London’s classic, red telephone boxes. 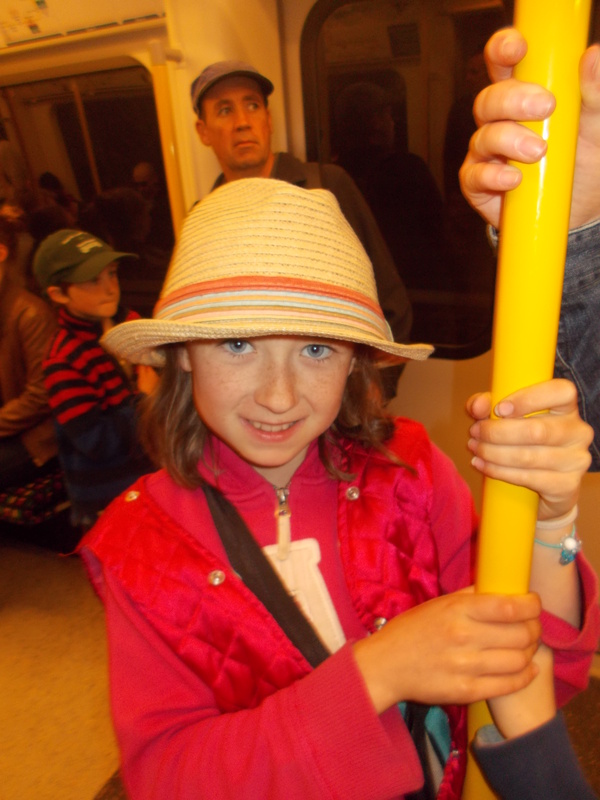 Next up is a little trip on the underground, it was a little busy so we had to stand. A London experience just isn’t complete without an underground journey. 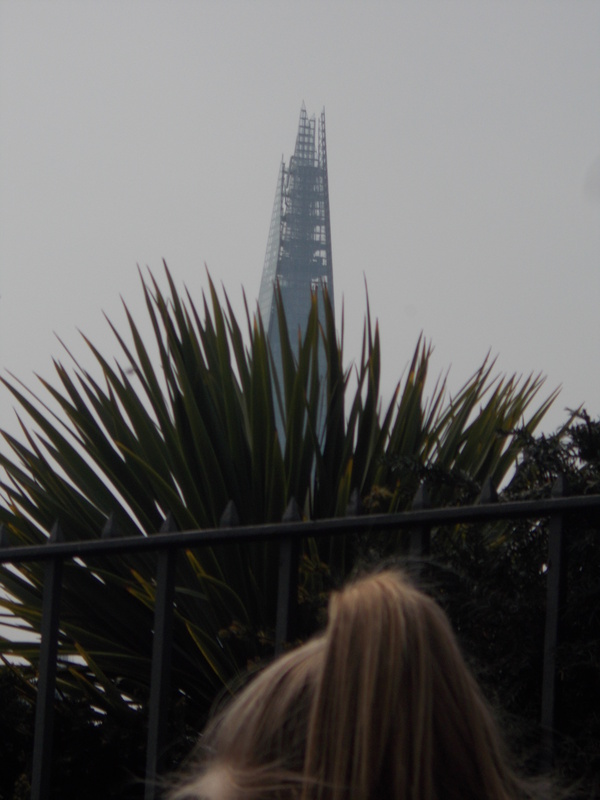 Such a cool photo of The Shard behind a bush. It looks like it’s just exploded!!! BOOOM, BAAAM and BOOOOSH!!!!! 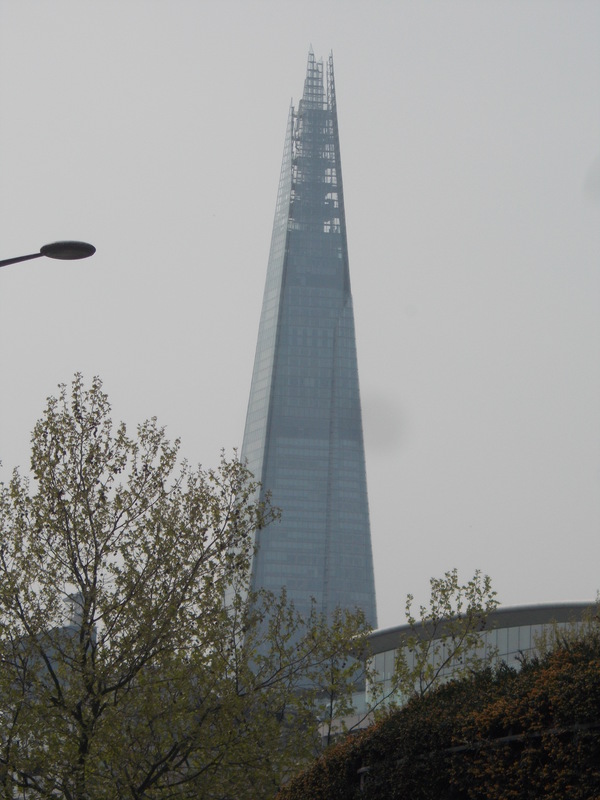 The Shard is now the tallest building in London. The thing Clairie really wanted to see in London was Tower Bridge and as The Tower Of London is right next door we decided to visit both. 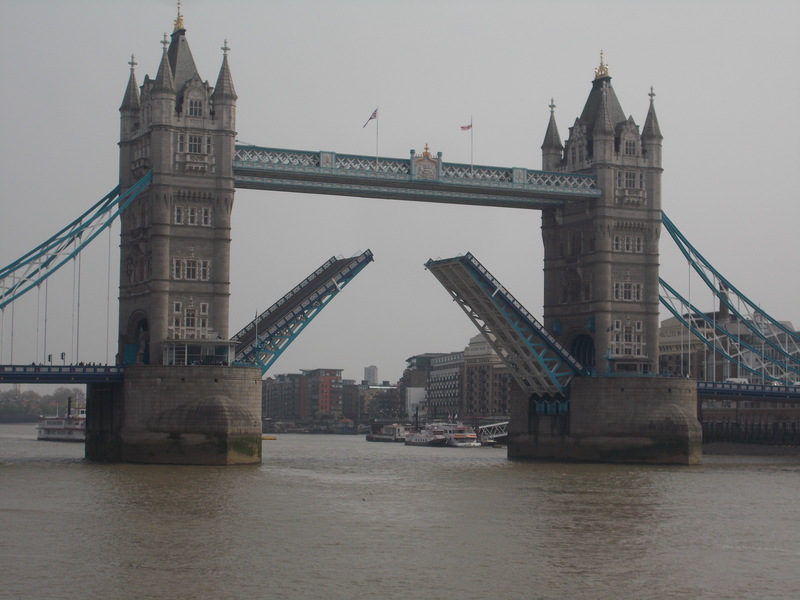 The Tower was really good, we saw Traitors Gate, but Tower Bridge was amazing. Just as we were getting ready to leave, a horn sounded and the bridge opened to let a wedding boat through. It was so cool, we hadn’t expected it to open at all!!!! 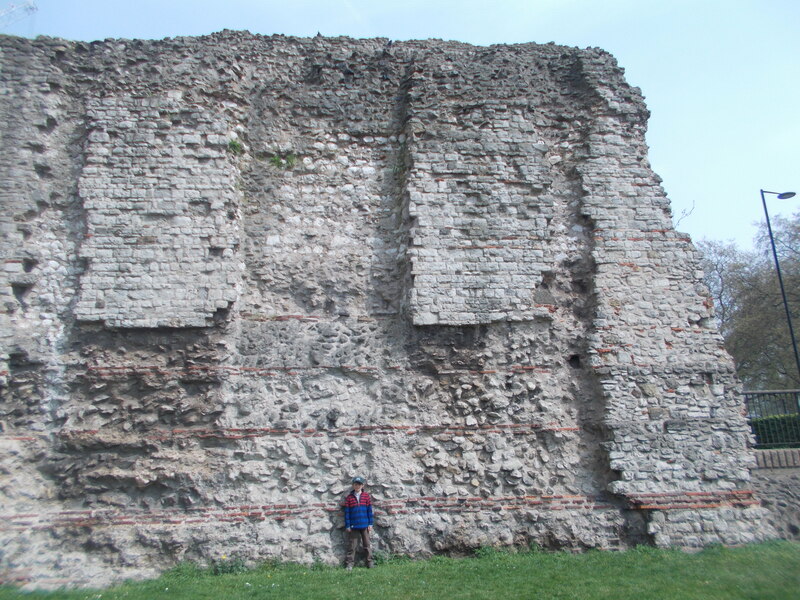 We saw the wall that the Romans built around London while they occupied it. They purpose of the wall was to protect the city from invaders. Eventually London outgrew it’s wall. 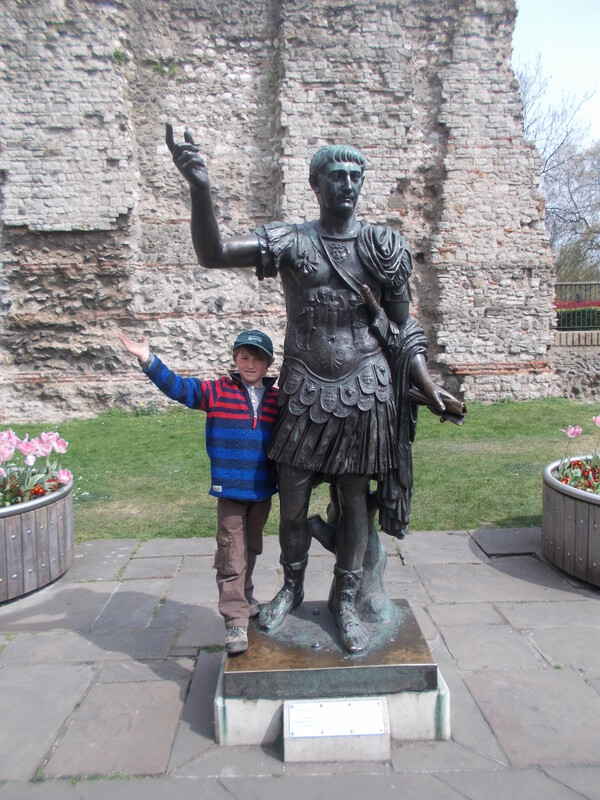 Beside the ruins of it stood a statue of the emperor Tiberius. My brother, Evan, is history mad. He enjoyed this part of the trip. Evan by the wall. I bet no enemies could get over that!! Irys and I posing as royal emperor’s assistants. 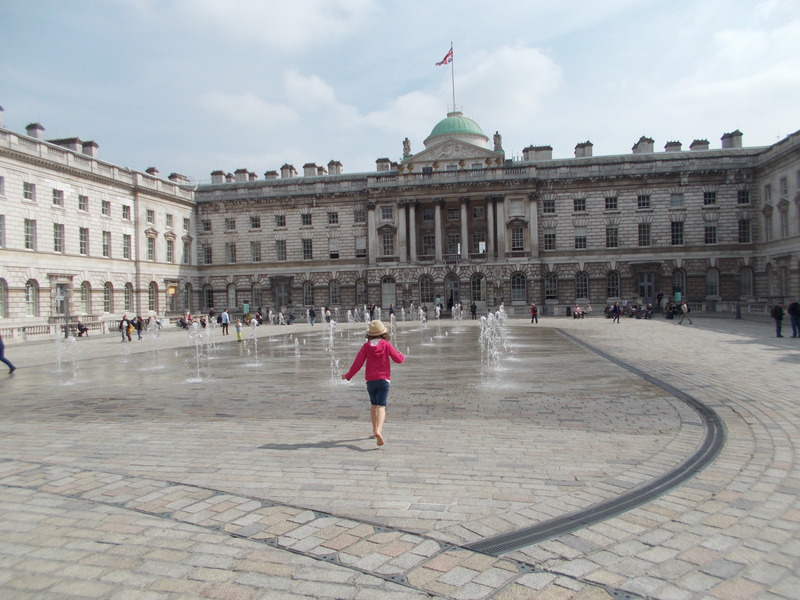 The next stop was my favourite part of the trip: Somerset House’s Fountain Courtyard!! Mum was explaining to Clairie that in the Winter there is a huge ice rink in the yard and in all the other parts of the year there are big fountains you can run and play in. 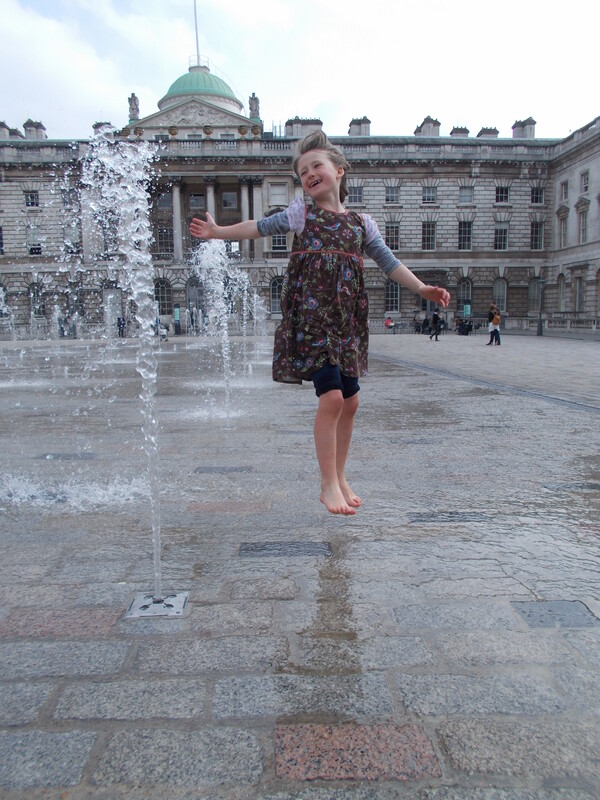 As it was a really hot day, I asked if I may go in the fountains, I’m so glad that the answer was yes. Me, Dad, Evan and Irys skipped and jumped in the beautiful, sunny fountains. 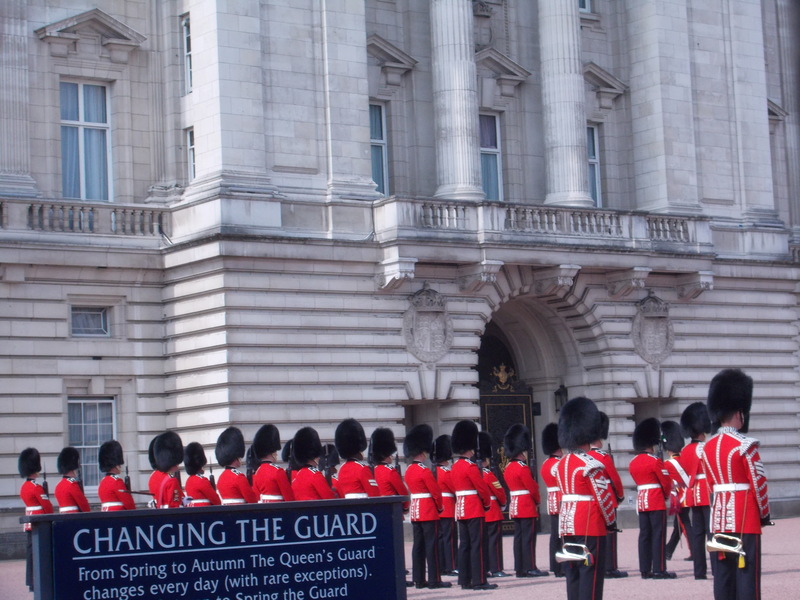 It was much to the amusement of lots of people enjoying the pretty sights and grand house. Loads of folks with snazzy cameras took pics of us , but I didn’t care, I was having the time of my life!! 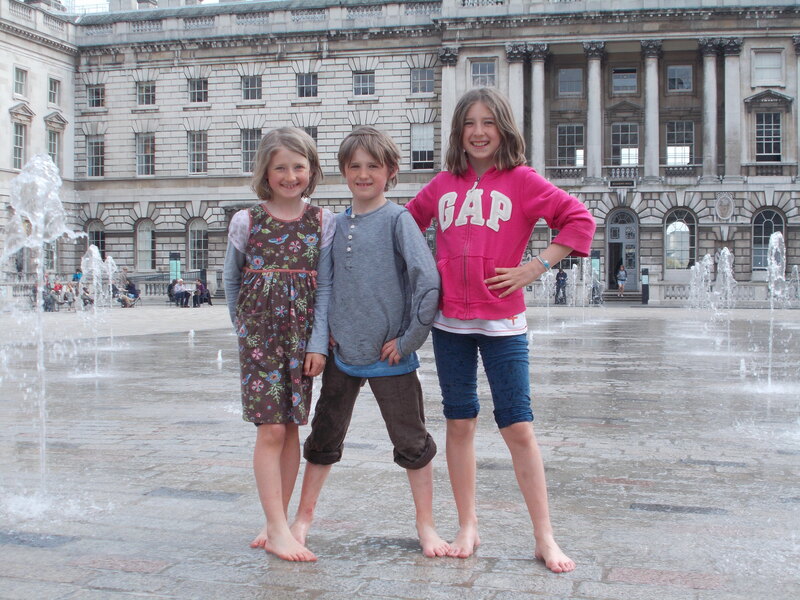 Barefoot, with our trousers rolled up, in London? Mad!!! 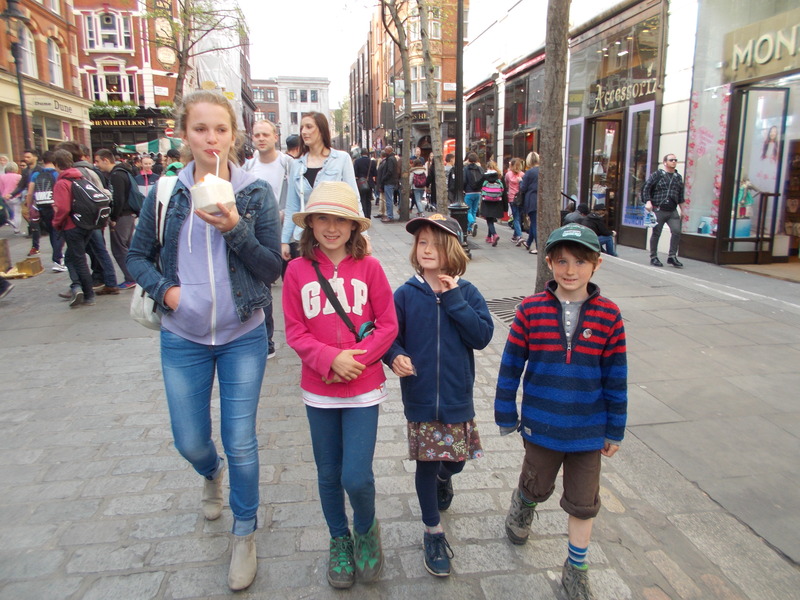 Time to move on again, this time to Covent Garden, Clairie’s favourite spot. 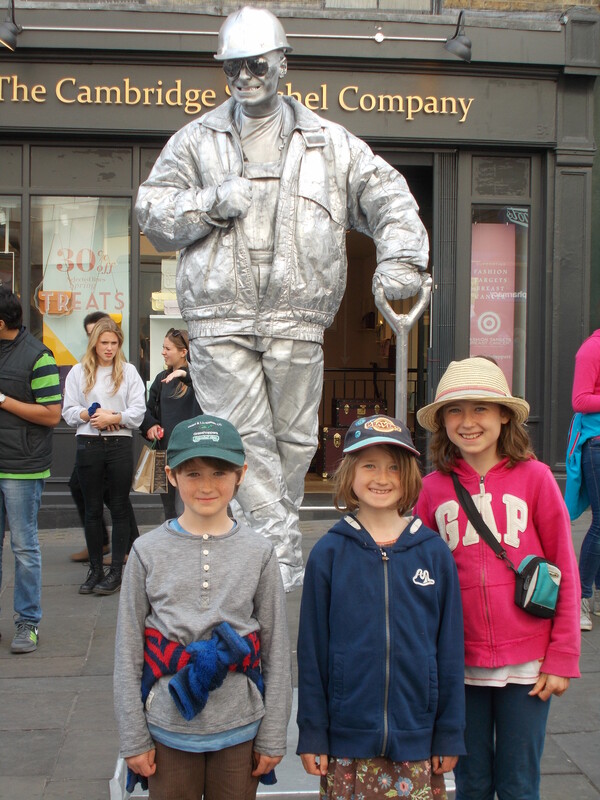 We walked along all the shops, watched some street acts (including an opera singer and a man who performed magic tricks), Clairie bought a coconut full of coconut water and we saw the living statues. We also visited the Tintin Shop and bought a mask. Clairie, me, Irys and Evan. Trafalgar Square next!!! 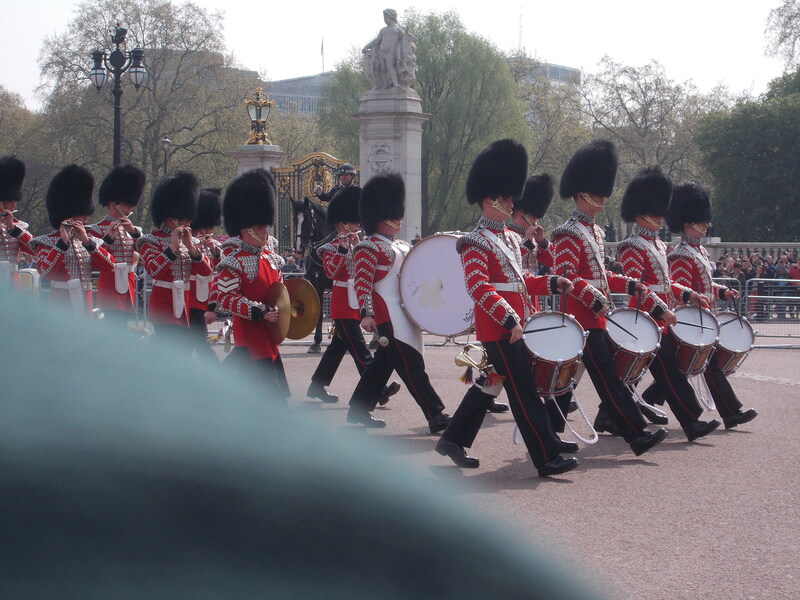 We saw Nelson’s Column and the Canadian and Ugandan Embassies. Such a brave and proud man. 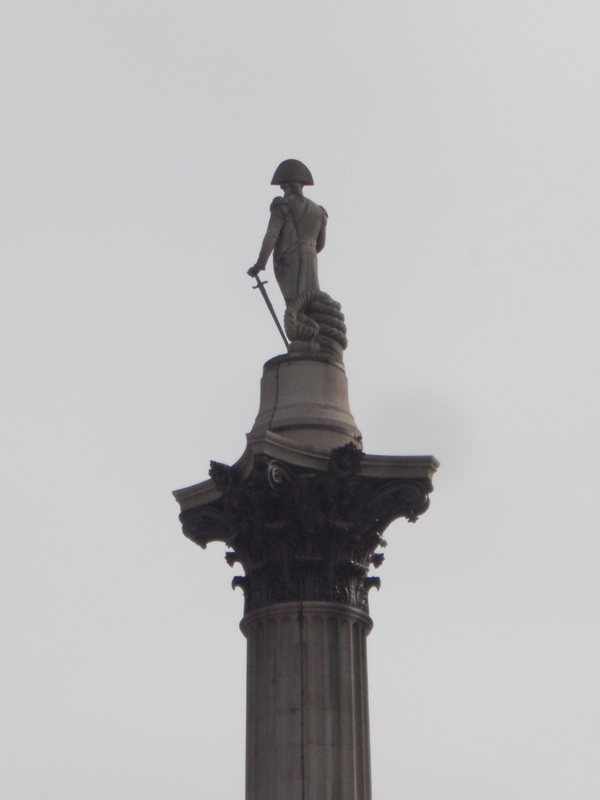 He died for his country and so he deserves his place looking down over London. Back down The Mall, all of our legs are aching now and our feet are sore. 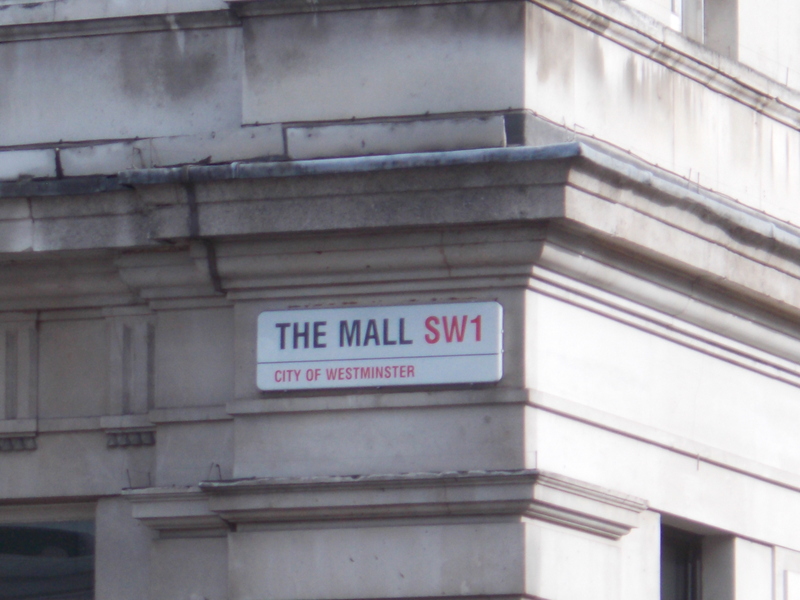 The Mall, The City Of Westminster, London, UK. The train home was a bit of a squeeze. Oh well, you haven’t experienced London properly if you haven’t been shoved in a crowded train carriage fighting for personal space and gasping for air. On Saturday Mum, Irys and I were sitting inside, when we heard shouting outside and saw Dad’s hand by the window, in it was a male blackbird. I rushed outside, so did Irys. “Is it dead? Dad, is it OK?” I asked. 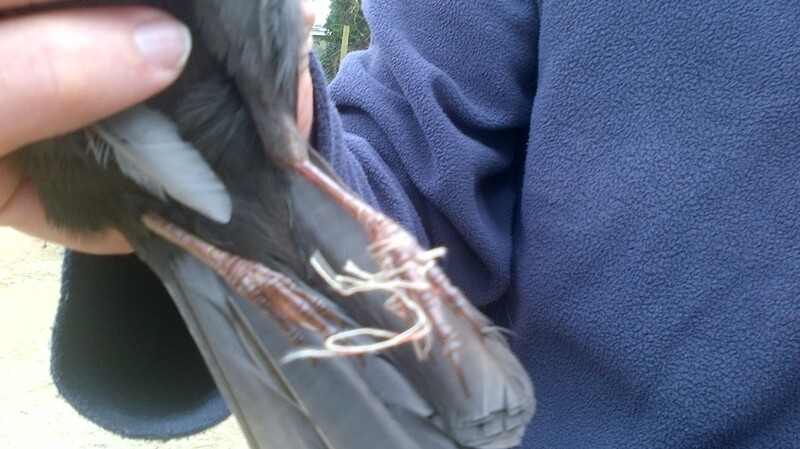 Dad and Evan explained how they’d found the poor bird hanging upside down by a thread tangled round it’s claw. It had been hanging there on a bramble. I went in and got a pair of scissors, gently I tried to cut the thread off. He squirmed and fidgeted, but Dad stroked and soothed him. 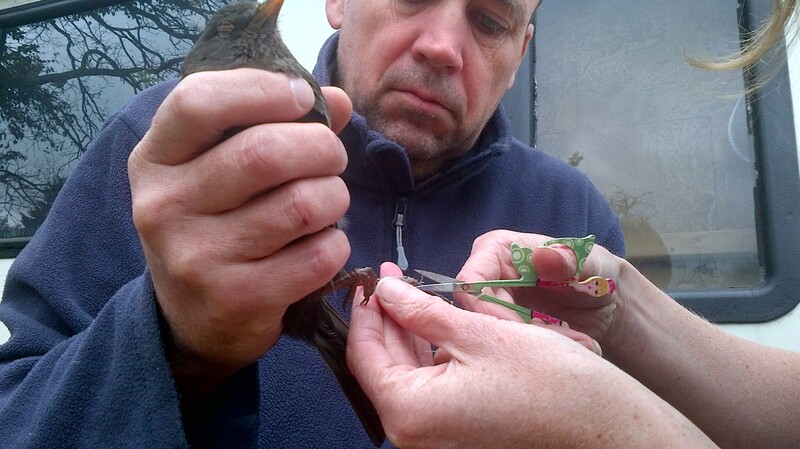 By this time Mum had emerged and she began the delicate operation of freeing the bird from the string. 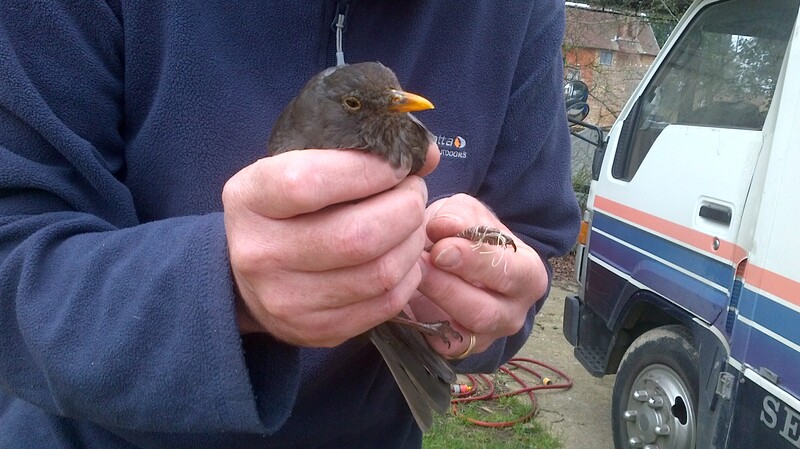 Eventually it fell off and we picked up our little blackbird and put him in a small sheltered building. 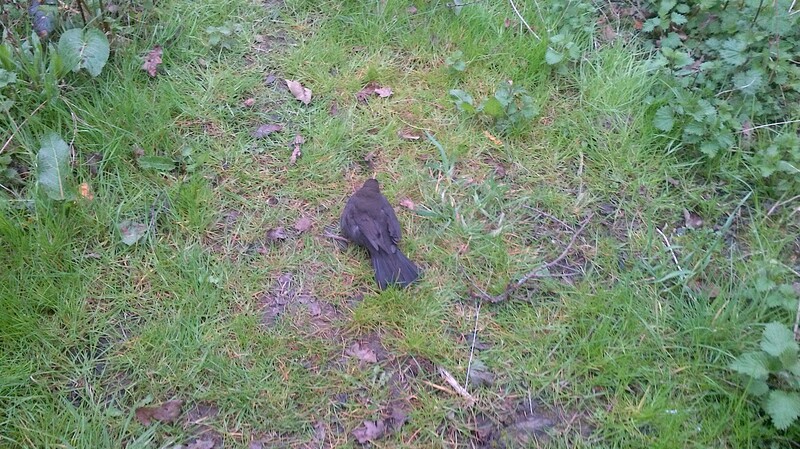 As we put him down, we noticed that his leg fell from under him. I thought it might have been broken. He sat down and rested with his eyes closed. We got him a worm and a dish of water. When we went out, we freed him and he hopped off. Hopefully he’ll soon be back to normal and singing his sweet song again. I’m so excited that spring is just beginning and I’m sure everyone else is too. Spring is such a lovely season, the world gets lighter and the days get longer. It’s a positive season, things that happen are good. I like to think of spring as the light at the end of a long, dark, gloomy tunnel. The tunnel is winter. When we emerge into the sunshine it is a time to rejoice. Spring is cheerful, it makes you want to whistle a little tune!! 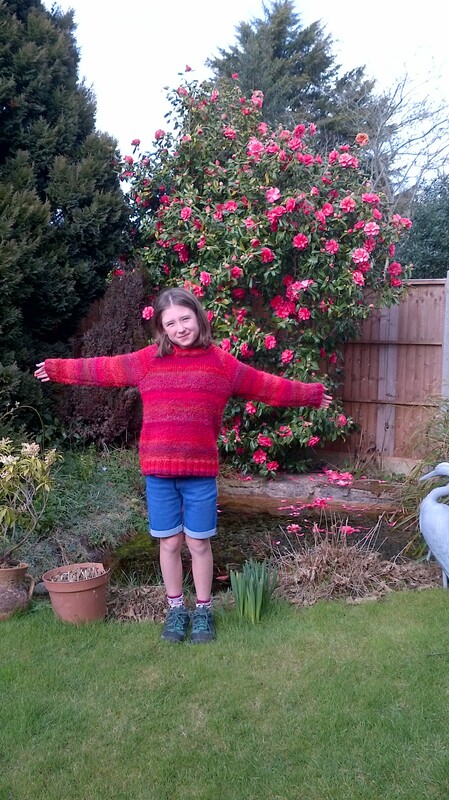 Spring has arrived in Granny’s garden!! in all colours white, blue or maroon. criers announce, tis such a happy day. “we’re happy at our play”. there’s not one single frown. 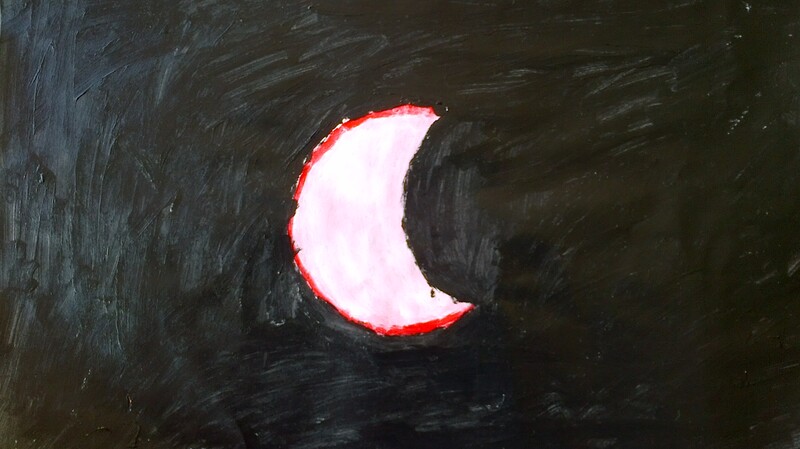 my picture, I painted the whole paper black and then did the moon and light in white chalk. constantly she’s on the run. he’ll gobble her up, if speed she does lack. gradually he gains on her, moment by moment, day by day. 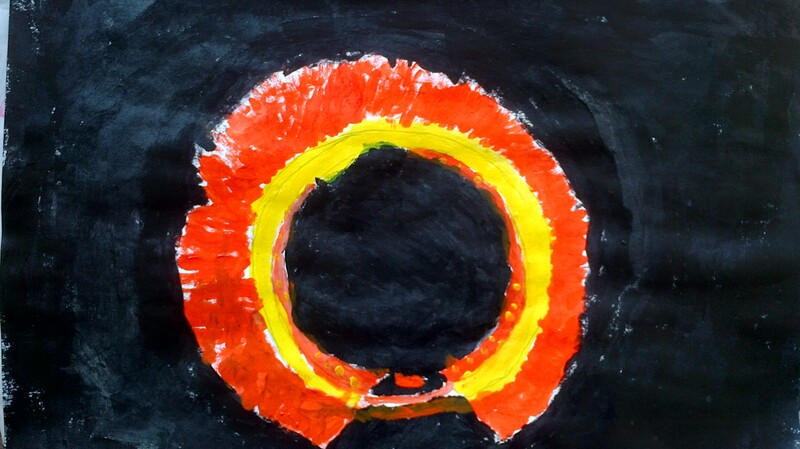 but from out of the circle, comes a bright and fiery spark. no one even thinks of retiring, home. 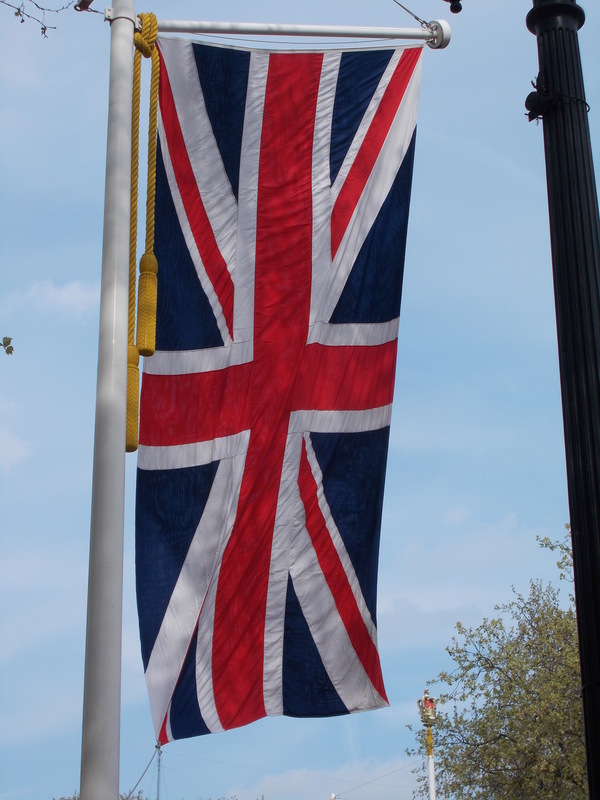 it can be seen in London, Brighton, Scotland or Cheshunt. it touches people down in their very soul. 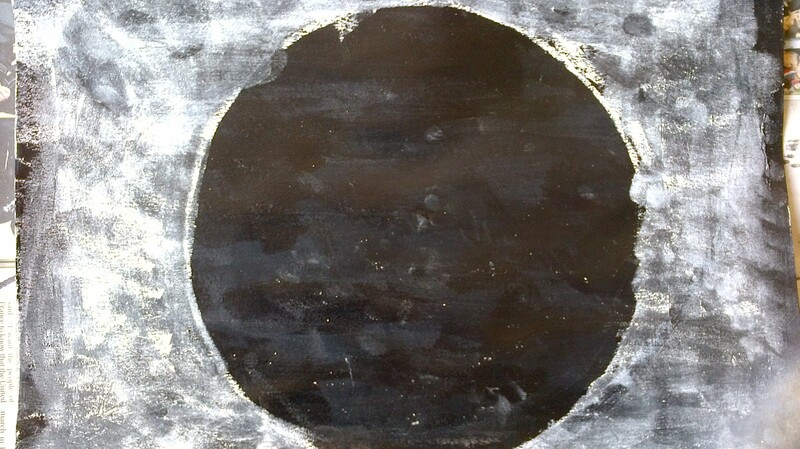 to see the moon and the sun do their amazing dance. This is my brother’s picture. He likes to use bright, bold colours. Here’s my most recent poem that I’ve written. You’ll have to use your imagination, who is the girl? Who is the mysterious messenger? Is it really a bird or is it just a metaphor? To be honest I don’t even know what the answer to any of these questions are, but I do know that they can be anything you want them to be. but I will hear your cry. that’s when I’ll hear you cry. then I will guarantee I will completely satisfy. safe from harm and danger, I pray. and you’ll be safe, I know you will.